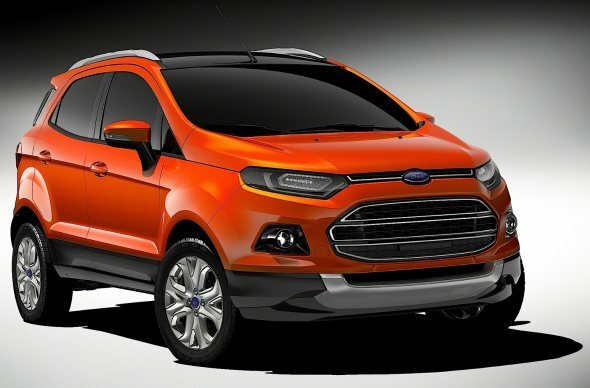 Brazil is the first lucky country to get the new Ford EcoSport, which will be launched in the first week of August. The excitement is building in Brazil, as Ford has already started taking pre-bookings for the EcoSport since July 14. It has already chalked up over 1,300 bookings according to NoticiasAutomotivas.com.br. Don’t be shocked at the prices – prices in Brazil are far higher than they are in India. To give you a comparison the Ford Fiesta in Brazil is priced at Rs. 13.5 lakh for the base variant (about 50,000 Brazilian Real). However, the Brazilian pricing of the EcoSport does not give much of a clue as to how it will be priced in India. For one, in India, the Ford EcoSport can get an excise duty concession because its length will be under 4 meters. The EcoSport will attract only 12% excise duty, while the Duster is charged at 24%. This should help Ford price the EcoSport below the price of the Renault Duster – and if Ford can do that, it has a winner on its hands. Because in the Brazilian market the Duster is actually cheaper than the Ford EcoSport, with the base Duster priced at Rs. 13.2 lakh (converted). The EcoSport in Brazil features the Sync infotainment system in all the models, and this is likely to be the same on the Indian versions too. Expect ABS and airbags also to be standard on all models of the EcoSport. Ford India has indicated that the EcoSport will be great “value-for-money”, meaning it won’t skimp on features. This does not mean it would be priced lower than the Duster, but it could mean, it will be priced at about the same price as the Fiesta. This indicates that the Indian Ford EcoSport could see a price of Rs. 7.4 lakh for the base model, going up to Rs. 10.5 lakh for the top-end diesel version. This would pit it exactly against the Duster, but the EcoSport is likely to offer more features even on the base variant – and that would be great value for the Indian buyer. There are likely to be six variants in the Indian market, including an automatic transmission petrol version. The EcoSport may be showcased again in India at dealers in October, with actual launch taking place in January 2013. What do you think Ford India will price the base EcoSport at? Share your thoughts and tell us in the poll.